As many of you may know, one of my favorite up and coming artist. I’ve been following him since college in his Young Sinatra mixtape days, and when he finally went Gold on his debut album “Under Pressure” as he took us on a trip through his life. He also gave a treat to the nerds with “The Incredible True Story”, dealing with space travel through skits, while providing quality music. He even made a mixtape just for the summer with “Bobby Tarantino”, as he claimed that one was for the party, but this next one is for the spirit. Well from recent buzz and videos of his upcoming album “Everybody”, it seems like he will deliver on that statement. He recently caused some controversy with the code name for the album AfricArayaN. Many don’t know that he is mixed “Black and White” due to his skin complexion, so many attacked him for the title, including rapper O.G. Maco, who still is trolling Logic and his fans. He wanted to talk about being on both sides of the spectrum, as well as focus on how races view him and others. But now he wants to make an album that focuses on all those who aren’t treated equally, yet they deserve to be. Neil deGrasse Tyson will be heavily featured on the album as well which I am sure he will be carrying the theme of the album. The album art is also interesting as it shows many people of different races and orientation. The Key thing is that it also shows who worked on his album, which point to artist like Alessia Cara, Killer Mike, Khalid, and possibly a feature or production from J. Cole. This project I am definetly looking forward to as it drops May 5, 2017. The track list looks promising as a few of these standout to me especially the track titled after the suicide hotline. With a feature from on the rise Khalid and Singer of Here Alessia Cara, its guaranteed to turn some heads. Also I wonder what Mos Definitely will be covering, as it is obviously named after Hip hop’s Mos Def. Below in the video’s he explains the concept of his album as well as share why he made it. 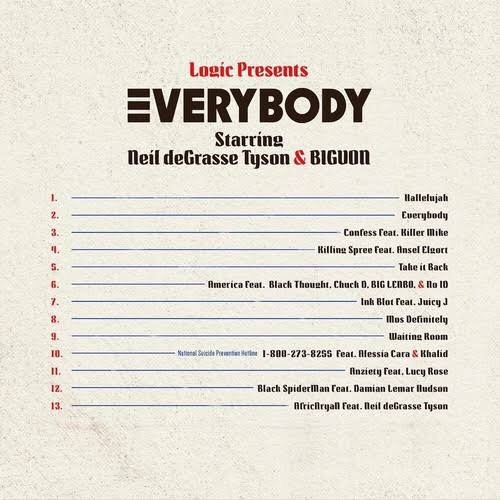 Also catch the First Single “Everybody” Below as well as his breakdown of the lyrics. RaTTPACK BOIII!! !